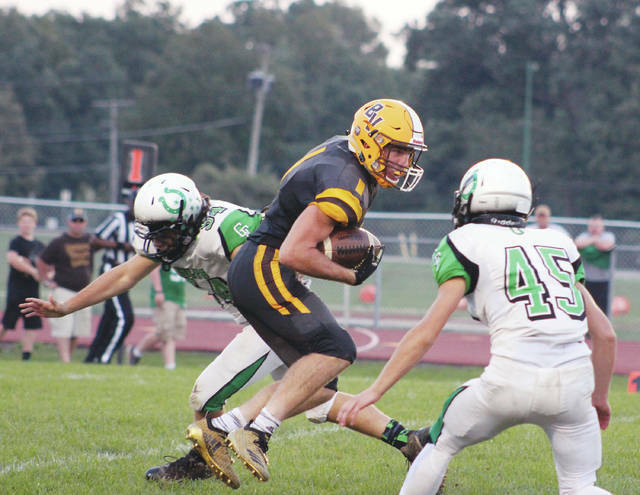 Buckeye Valley’s Beau Ewing (1) makes a cut between a pair of Clear Fork defenders during the first half of Friday’s MOAC showdown in Delaware. Buckeye Valley’s Mike Franckhauser tries to rip the ball away from Clear Fork’s Caden Flynn (5) during Friday’s league game at BV. There was no mincing words and there was no shining it up for Buckeye Valley football coach Matt Stephens. It was quick and it was decisive. 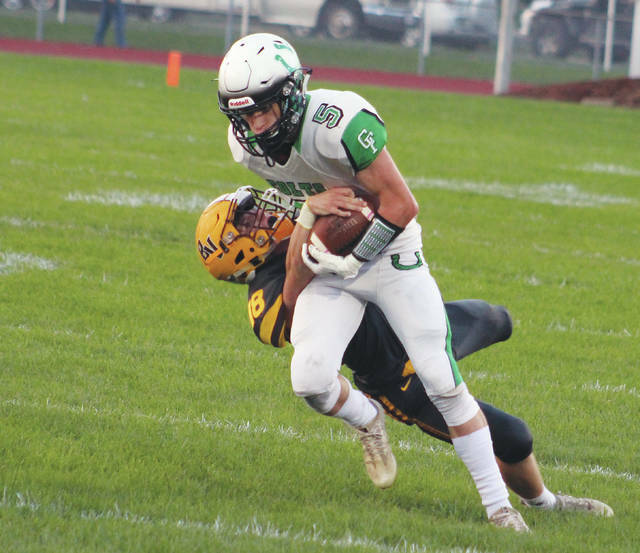 Clear Fork reeled off 34 first-half points and cruised to a 44-0 win over BV to spoil the Barons’ physical home-opener. “We were bad on both sides of the ball this week,” Stephens said. “We’ve had games where the offense was playing well, but the defense wasn’t or the defense was playing well, but the offense wasn’t. Jared Schaefer ran for a pair of touchdowns and threw for two more to lead the visiting Colts to an MOAC win Friday night in Delaware. Even when the Colts’ backs were against the proverbial wall, they still found a way to do damage. Case in point – Schaefer scrambled for a 20-yard touchdown run on their first drive. He added a 6-yard run two drives later to push it to 12-0, then found A.J. Blubaugh on a 13-yard touchdown in the second quarter. When Schaefer wasn’t doing damage, Brennan South was. South made up for a first-quarter interception by finding Caden Flynn for an 82-yard touchdown down the left sideline to give the Colts (5-0, 2-0) a 20-0 lead with 9:52 left in the second quarter. Trammell capped the first-half scoring with a scoop-and-score 18-yard return of a blocked punt to give the Colts a 34-0 lead. Clear Fork came up roses on its third-quarter touchdown, too. Schaefer found Blubaugh on a post route for a 79-yard touchdown pass. The Colts were facing second-and-41 after a false start penalty and a snap over Schaffer’s head. Gabe Blauser added a short field goal in the fourth quarter to cap the scoring. “(Clear Fork) is a good football team – we knew that coming in,” Stephens said. Andy Anthony had an interception in the second quarter for the Barons (1-4, 1-1). Next up, BV continues league play with a visit to Ontario next week. Kickoff is set for 7 p.m.